An idyllic rural scene on the banks of the River Derwent below High Tor. A milkmaid is standing close to the riverside track, with three cows on her left and probably her milking pail on the ground to her right. She seems to be talking to a [young] man who is reclining on the ground near her feet. On the track itself is a stooping man with a long stick who is walking away from the pair. He is smoking a pipe whilst leading his donkey. On the far side of the riverbank, between the cows and the young woman, is an entrance to a lead mine. Although it is not easy to see, there is a small house on the hillside on the right which is surrounded by a stone wall. This was part of the property that Thomas Brentnall sold to Samuel Bown in 1790. There is a clearer view of it on Francis Chantrey's 1822 drawing. The cottage was eventually demolished when Tor Cottage (the High Tor Hotel) was built. This portal must have provided access to the southern continuation of Seven Rakes (High Tor Rake). Detail, showing the Brentnall property that was sold to the Bowns. 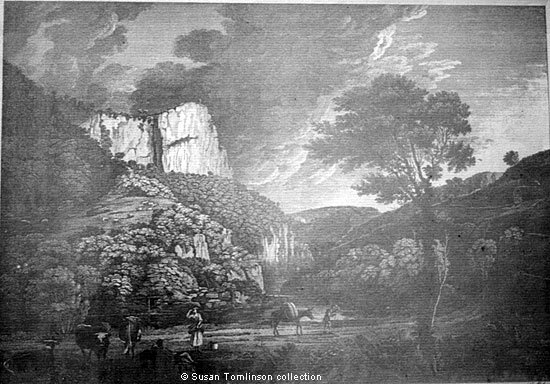 Etching of "High Torr" from the collection of and © Susan Tomlinson. Information written and researched by and © Ann Andrews. With thanks to Colin Goodwyn for his research: "Plot 324 consisted of 20 perches, allocated in Matlock Enclosure Award of 1874 to Thomas Brentnall, and the adjacent plot 323a was of 10 perches, which was awarded to Samuel Bown. Brentnall sold his plot to Samuel Bown on 2 February 1790. The plots are shown on the Award map. This whole area was known as Common Wood and was part of Matlock common land being enclosed by that Act".